Today is the 9th day far from home and I tried yesterday to bring in mind and describe all the interesting bits so far. I hadn’t found some time to properly write down my thoughts, or even put my photos in order, so what you get here is a bit messy. Firstly, I ‘d like to say I am not a proper traveler yet. This is partly because I am not properly documenting what I see nor what I feel. You see, I am in the process of familiarising with this different reality right now. These days there were a lot to do in terms of everyday practicalities, but also a lot to do on-line. Where to eat & sleep, learning the bike, learning my equipment etc. I should also mention that all this internet stuff, from the blog to the social media accounts to capturing – editing stuff and writing is all new to me. I need time to get acquainted with it and hopefully to get better. The first part of this week was intense in terms of cycling and really tiring, while the last 4 days I am more relaxed. Apart from this blog post I want to write down some things on how I got up to this point (The history so far II, at the bottom you can find the part I), some detailed thanks to the persons supporting this effort, and also some things about the beautiful and very special place I am being hosted right now. To begin with, I need to make clear that this whole project (I don’t like that word, it makes it too… I don’t know, engineered?) trip was mostly organised at the very last moment. I was dreaming-thinking-googling it for a looong time, but doing stuff – I mean producing some work – happened only after mid August – yes, well read, mid-August. This was also because of a huge change in my plans on late August I think (but more on this later). My initial plan was to leave on the 1st of September, and then on the 1st of October, and then on the 15th and then on the 19th and then on the 22nd and then on the 26th. My friends were bored of hearing me “leaving” and my neighbors were mocking me. I finally left on the 27th. Yeah! But still there are some issues I have to take care. What was ahead of me was totally unknown and pretty unexpected to be honest. Let’s take it from the beginning. Right outside my house, leaving! I left my house on Tuesday, 15:30 – really late, considering I had said to myself “never ride at night”. Right at the first 200 meters I had my first unpleasant surprise – as I pedaled on the main avenue close to my house my electric kit “add-e” didn’t start working. Stopped – checked – everything seemed OK. Pedal again – no add-e. UUuuuurghhh – I had forgotten to charge 1 out of my 3 batteries (! ), so I left for my first journey with 2 out of 3. For this, I had to be really careful as I didn’t really know what to expect in terms of range from add-e. I had tested it only once in Athens with my bike fully 20kg loaded and at that test ride I did brake one of the sensors (I hadn’t tied a bag properly, so a strap got into and around the spokes and teared the magnet of the sensor apart). So, practically, I didn’t know what to expect… But I was fine – I felt a bit Jesus-angelos-come-oooon… But I said to myself “you left man, now you left – just go” and I just continued…. 2 km after this another incident happen that was really close to broke my heart – but it didn’t. Again, I hadn’t properly closed my front bag and my camera (one of my most expensive piece of equipment) just hopped off and crashed at the road. The noise of it hitting the ground was… just heartbreaking. For some seconds I hadn’t realised what exactly fell, but soon enough I saw it with my own eyes. Actually, as I was waiting by the pavement for the cars to pass so I could get it, I saw one car coming over my camera with the front and then with the rear wheels – and my camera going here and there…. Result…. Hehe – What seemed strange even to myself is that it didn’t bother me t hat much. I had paid a good amount of money for the camera and 2 nights before that incident I had this, you know – like loving a new gadget/thing you buy – when you find it amazing. But, I was so happy that I left I said “ok, it’s just a camera – look at the overall picture, look from above”. Now, apart from me leaving Athens, so did the sun. It was 18:00 or sth like this when it started getting dark. Off course I had my amazing Tikka RXP super bright head torch that I planned to use it if need be to ride at night. It should be in my front bag. But it wasn’t. I checked again and again but nothing. I thought it “jumped” out of the bag like the camera and I just didn’t realise it at that point. Frustrated I just kept riding in total darkness for some miles. (Asterisk: not total darkness, as it was a full moon night).. In my whole happiness bubble there were angry spots of mindlessness – 2/3 batteries on my first journey, broken camera, missing head torch, forgotten multi tool (yes, I couldn’t find it before I leave) – bad start… In addition, it was such the pressure of the last days of preparation that I hadn’t managed to find a host in Korinthos – so I just found a hotel with wi-fi and warm shower and stepped in. Actually, it was much better – I stepped in, asked if a folding bike was allowed into the room, they said yes and I just stepped outside and did this. Went in – got into the elevator with my bike and stuff and had a beautiful night. 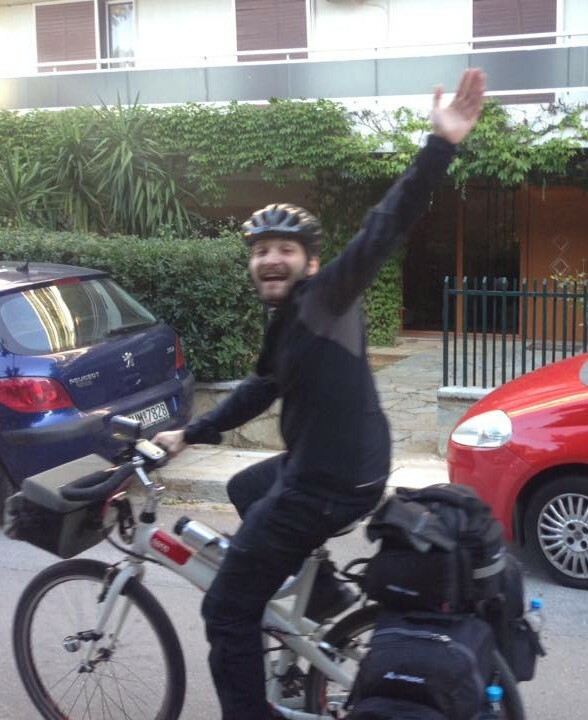 Wednesday morning I set off to Patras: 130km, 3/3 batteries. On the road I had some testing with photography and stuff. It was nice. I was amased at the range I could get with add-e in not-so-really-climbing situations. 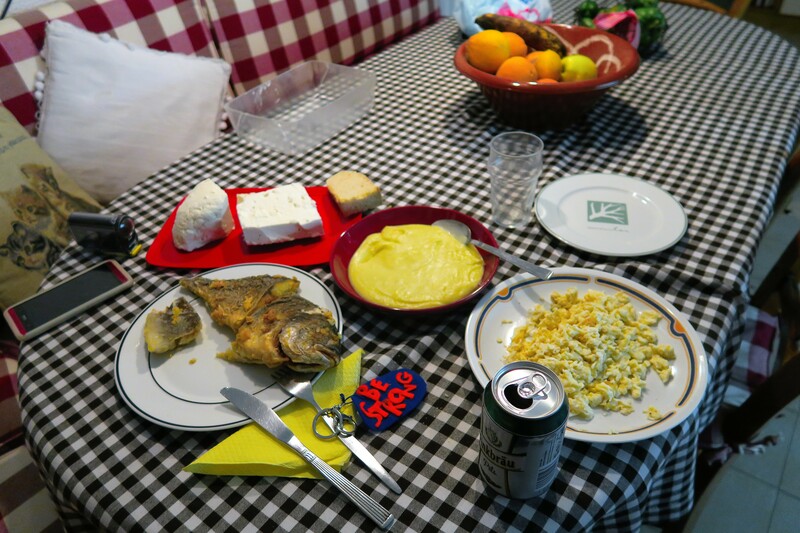 I reached Patras, stayed at aunt’s Roulas place, where I had an epic, full of protein meal. Yeah! Thanks theia Roula! Feta, skordalia, tsipoura, aspradia, biritsa yeah! I got some rest and next day, Thursday, we left with cousin Stamatis and good friend Manolis from Patras to reach Astakos in the western part of Greece. What a day was that! Before we cross the Rio-Antirio epic (longest cable-stayed “suspended” deck) bridge (in the world) I had an interview with a local TV Channel. First time in my life – very interesting as an experience. I said goodbye to all good friends and lovely relatives that came there to farewell me and sett off. Now watch how things progress. While we were riding, some 4-5 km after the bridge, I kind of forced my cousin Stamatis to get some of the cake I had in my hand. Despite his initial unwillin gness he did moved his hand towards me and with this movement he accidentally hit his cellphone that was mounted on the handlebar. Cellphone fell and broke (but was still functional – hehe) and Manolis who was coming at great speed immediately stopped to reach the phone. 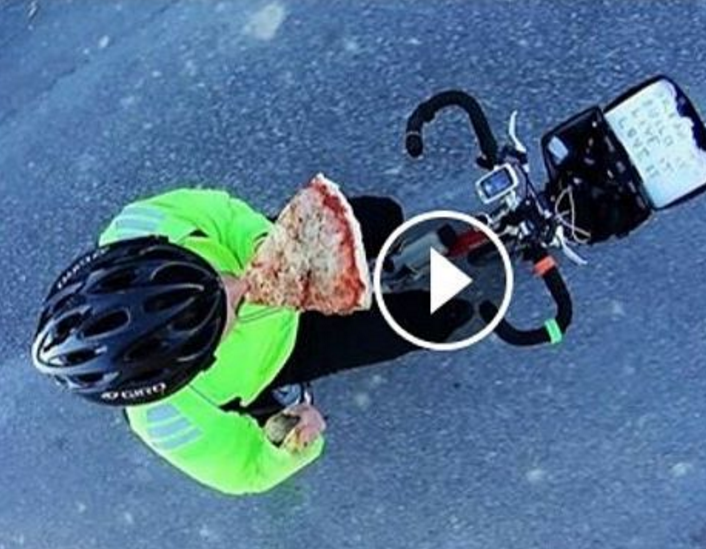 This resulted in a hole on his tire due to high friction with the road surface – not only a flat inner tube but also a hole in the tire itself!!! We had another tube but the tire was pretty useless. We used duck-tape as you can see. It was noon. 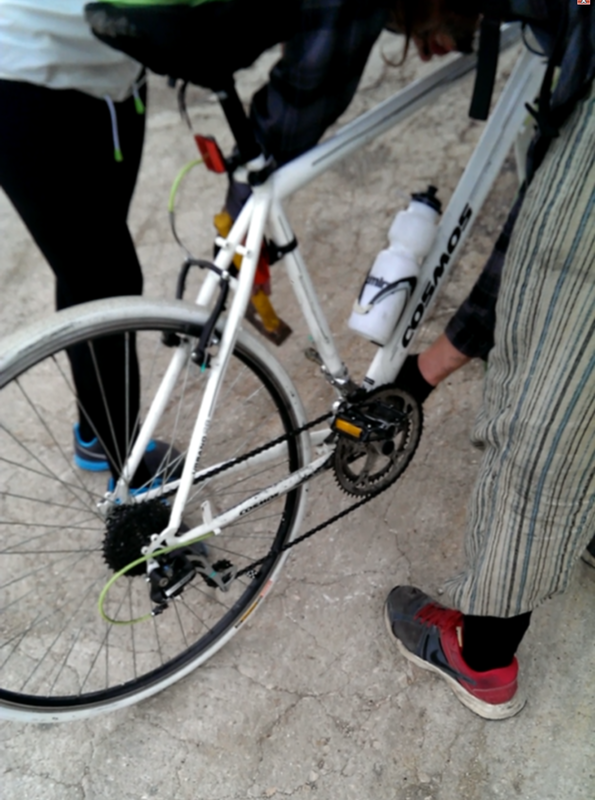 After sth like 5 km we hear a baaam – Manoli’s tire was now destroyed and we couldn’t do anything! But, wait a second! This place looks familiar – the tire became totally useless just 50 meters far from the house of Vana, a relative of my friend Demie . Vana is a really open and cheerful person who I really appreciate despite the fact I hadn’t seen her for 3 years or so! We kind of stepped into the house and she was so kind to take the bike and Manolis to the closest city, Mesolongi, in order to find a bike shop and get a tire! We went to Mesolongi, but it was noon and the bike shop was closed. We called the man and he said he ‘ll come earlier than usual but not now. We went to eat sth, repaired the tires and off to Astakos where we camped at an amazing beach! Next day it was Friday. Before we set off, while climbing to get to the street from the beach, Manolis managed somehow to warp his disc. Sth amazing happened that I had never seen in my life. While he was pedaling the chain was coming off the one disk to the other and then vice versa. So you had an always-changing-disks chain that was practically useless. He hammered the disk several times during the ride, in order to get it work properly – sth that he never achieved. Despite that, huts off to Manolis because he was following 2 e-bikes on steep mountains LIKE A MAN! So, MANolis from now on! Haha! We reached Preveza that night, we camped next to a kind-of-beach, in-between some trees. It was really windy! Feelings? I feel so full – like really.. Full. I don’t know. I am peaceful – I guess it’s a feeling you don’t know it’s there (somewhere inside you) until you get to it. Or, until it gets to you. There are so many things to organise and be mindful about, but I am feeling truly relaxed and everything-is-on-their-way-to-awesomeness, no-worries-just-reflect-and-feel-and-listen-to-the-people-next-to-you. Right now I am being hosted at the Church Boarding School of the Holy Cross in Gjirokaster. I thank a lot for this the principal and close friend of mine Father Eleftherios Balakos and also Alexios Pappas who is an elementary teacher at the Greek-Albanian school “Breath of Love”. Alexios kindly invited me to the school, where I talked to the kids about the plans of my adventure and presented the bike – it was such a nice experience! Also, I would like to thank the principal of the Elementary school, Melpomeni Kouremenou, for trusting me and letting me into the school. 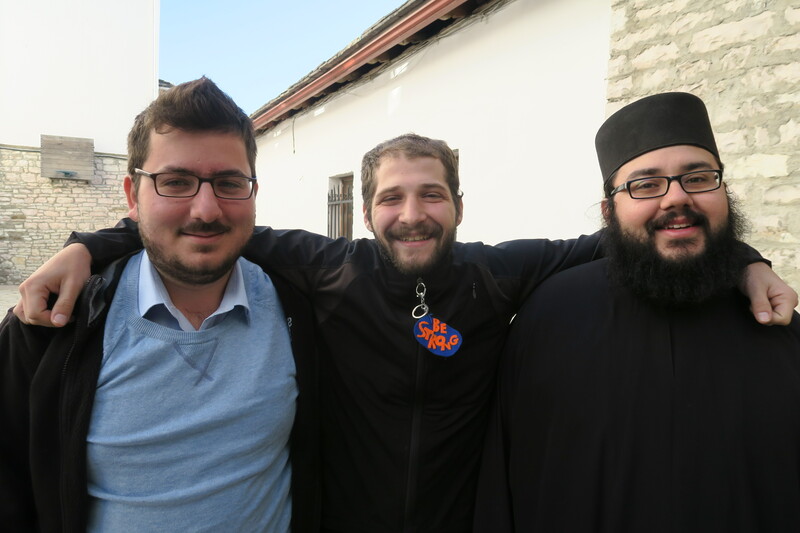 Alexios, myself and Fr. Eleftherios – Thank you! Presenting the bike and my dream! And yes, it can be folded! Εξαιρετικός, απολαυστικός και πάρα πολύ θαρραλέος. Εύχομαι να συνεχίσεις με τον ίδιο ενθουσιασμό, να φτάσεις μέχρι τέλους, να σκορπάς την αγάπη σου στους γύρω σου και τη ζήλια σε εμάς που ταξιδεύουμε μέσα από τα γραφόμενά σου. Very best wishes for your unique day, your Name Day. Concentrate on the meaning of your name, concerning yourself. We, your friends, shall be watching your efforts to keep to your plan and go through your “project”. Very best wishes for your unique day, your Name Day. Concentrate on the meaning of your name, concerning yourself. We shall be watching your efforts to keep to your plan and go through your “project”. Very best wishes for this unique day, your Name Day. Concentrate your effort on the meaning of your name, concerning yourself; we, your friends, shall be near you, watching you keeping to your plan. Go ahead, Angelo. I really liked your story so far. I intend to follow your journey through your online postings. Keep writing and don’t give up! Thanks a lot Johannes!I ‘ll do my best! Greetings from Albania!